In the early nineteen seventies a division of Westinghouse Corporation purchased 2,330 acres from the Barrron Collier family and began one of Florida’s most recognized and luxurious planned unit developments and named it Pelican Bay. The intentions of the developer were to preserve the entire Clam Bay eco system, later named Pelican Bay, and feature it along with the three miles of white sand beach front to be used by all of the residents of Pelican Bay. There is also a 25,000 square foot Community Center that features social, educational and wellness programs by offering a state of the art Fitness Center, a Wellness Studio that offers therapeutic massages and facial skin treatments, an Art Studio that offers instruction in a variety of mediums. There is a Computer Center with twelve 21 inch HP touch screens and printers. A Tennis Pro Shop that offers a wide variety of sport and casual logo wear and accessories. A Community Center with large meeting rooms that is divisible into several smaller rooms. Located on the ground floor, the 3,600 square foot room is the venue for banquet functions, Town Halls, Board meetings and large-scale activities. On the second floor there is the multipurpose room which is 2,100 square feet and is home to everything from fitness classes to bridge lessons. Dinner and A Movie nights, banquet functions and special community events also occur in the Community Center. There are two separate beach locations. One on the South end and one on the North end of the community. Both features a private, resident’s only, electric tram system that takes you over a raised board walk through mangrove forests and open bay area to the exclusive beach front pavilions. There you can enjoy the restaurants, bar, beach chairs, go swimming, kayaking or sail one of the catamarans. For the avid golfer there is the exclusive Club Pelican Bay. A private members only 27 hole golf club with a very limited equity membership, no tee-times and boasts a 40,000 square foot Club House with seven different dining options. Social activities are second to none and family activities are an integral part of the Club experience. Other great features about the Pelican Bay community is that it hosts the Waterside Shops, home to some of the nation’s best retail shops and local casual and gourmet restaurants. The Naples Philharmonic is also located within the community which is one of the state’s top venues for the performing arts and visual arts and hosts a resident orchestra. The Main Hall seats 1475 and the Black Box Theater seats 80 for more intimate events. There are a wide variety of residential communities within the Master Planned development. Luxury high rise residences overlooking the Pelican Bay preserve and the Gulf of Mexico, Condominium and Villa communities overlooking lush landscapes, water features and the Club Pelican Bay golf course and beautiful custom built single family home communities. 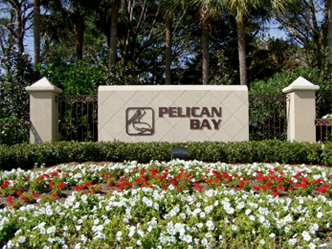 This unique and grand concept was proclaimed to be a model of environmental planning in the state of Florida and today there is no other PUD that has the natural features and planning for residential living that Pelican Bay offers. It’s one of a kind with everything that you could need within a short walk or drive from your residence.